This game was SUPER simple to make, and took approximately 3 minutes. - NO JOKE. The longest part of set up is remembering where you put your Thanksgiving decorations and tchotchkes. - Anyone else use that word? Don’t already own dice? No worries. I’ve got you. See below in our supply list or make your own like we did for our movement dice here! Touch as you count each item. Say the number name aloud as you point to the object. Take a group of objects. Count them. Now mix them all up. Count them again. Show that the group of five is still a group of five even when the objects are rearranged. Build quick number recognition. 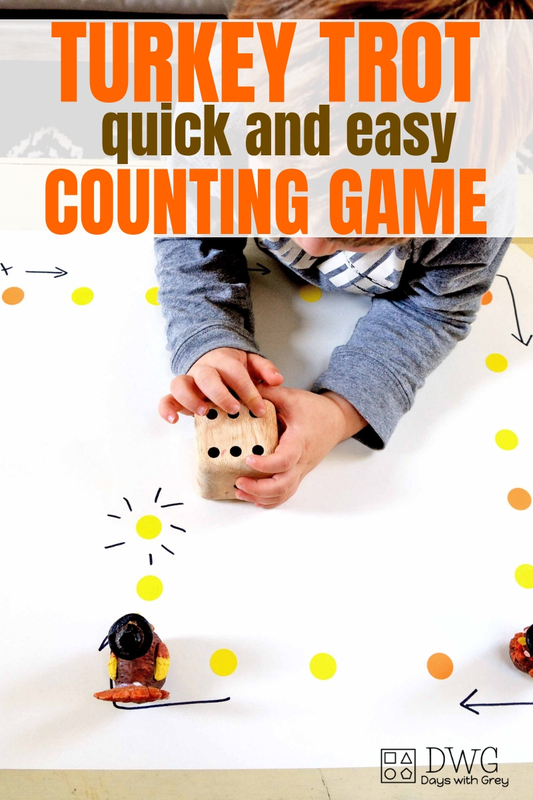 Work with dice and dominoes so the total amount becomes automatically recognized. Casually expose your preschoolers now so that this sounds familiar to them when they walk into Kindergarten! Both boys jumped right into this Thanksgiving Breakfast Invitation! In fact, we’ve already played 3 times. My oldest (almost five-years-old) LOVES games, and my middle (3.5 years old) needs some counting reinforcement. I rolled out my white paper roll and taped it to our kitchen table. This is how I set up all of our Breakfast Invitations. It is quick and easy, and allows me to catch my breath when we first wake up. Then I simply added dot stickers in a game board arrangement. Added arrows to show the movement. Since my boys are nonreaders, I also added a star to show the starting place. Left to right progression. When we read, our eyes move left to right. We also do this with writing. This is something that needs to be shown and practiced to young learners. Ring in November and set this Breakfast Invitation up today! New activities to your inbox every Monday and Wednesday at 7am.